Enable Media Center in Windows 8 Release Preview in Just ONE CLICK! 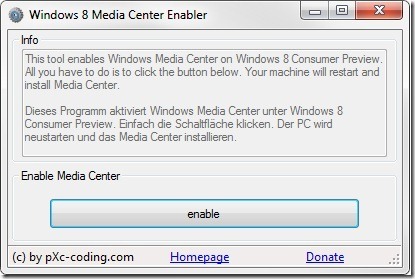 Enable Media Center in Windows 8 Release Preview by Just One Click! If you are using windows 8 release preview on computer then you may have noticed that Windows Media Center is not available by default. But you can enable easily if you want it. Official windows 8 faq has described a manual way to enable media center but if you need even easier steps, then here is a small utility program to do it. Windows 8 Media Center Enabler is a small freeware utility program which enables media center on windows 8 release preview in just one click. Just run this program on your windows 8 RP and click enable button, that’s it. Windows will restart and you are now able to see media center.